True optimism is earned. No one can give it to you. That is the problem with caring that translates into dependency trapping entitlements. But Circles® is a community-based initiative that is bringing hope to those in poverty who want to break its grip. Since President Johnson launched the war on poverty, government has spent trillions, poverty remains, and more and more Americans are increasingly dependent on government support. Hope and opportunity have given way to learned helplessness. Ronald Reagan asserted, “Welfare’s purpose should be to eliminate, as far as possible, the need for its own existence.” America should be judged not by how many citizens are receiving welfare, but by how many no longer need it. Circles® USA (www.circlesusa.org) is one proven community program that’s committed to ending poverty one person, one family at a time. Since people in poverty need to be in charge of their own lives, each Circles Class brings together 25 low-income “Circle Leaders.” These low-income participants are paired with trained middle-to-high-income community volunteers, called Allies. Together, they develop financial, emotional, and social resources, as well as an Economic Stability Plan tailored to the unique needs and dreams of each Circle Leader. The Circle groups nurture relationships and help participants develop coping strategies, appropriate formal language skills, and survival strategies to master the hidden rules that lead to workplace success. Community members provide time, talent and money to help participants help themselves. This is no quick fix. Families in poverty are encouraged to participate for up to 18 months. While less than 2% make it out of generational poverty on their own, a study of 1,000 Circle participants over 5 years found that 67% were successful in breaking the hold of poverty in their lives. The first Circle® USA program in Southern California is starting in the Conejo Valley in Ventura County. The mutual respect and relationships established between the Circle Leaders and the allies is a tribute to the power of community in dealing with poverty. 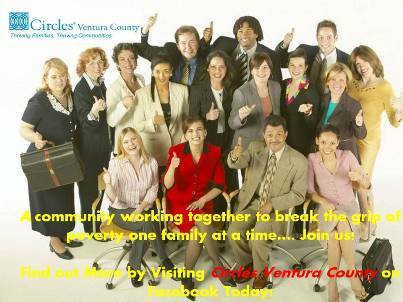 If you live in the Conejo Valley, find out more by visiting Circles Ventura County on Facebook. Register now for our free Wine Tasting Community Outreach event on August 14th at the Aldabella Winery in Westlake Village, CA. There is nothing more satisfying than making a difference in your own community. If it’s not Circles, find your own way contribute to earned optimism in your community.